ACA Signups | Page 322 | Healthcare policy data, analysis & snark. Some minor updates buried in the MNsure Board of Directors report; thanks to an anonymous tipster for calling my attention to it. Nothing major, but some small updates to both the Private QHP and Medicaid/CHIP enrollment figures (27,775 and 52,225 respectively). The most noteworthy addition is the 475 SHOP (Small Business marketplace) enrollments noted on page 27 of the report. ...in which we find the third ACA-created SHOP (Small Business Health Options Program) addition of the day. 2,155 employees is a pretty miniscule number (especially for the largest state in the country), but it's something. Note that it says "2,155 employees", which most likely means about double that when you include dependents, but as always, I'm leaving it here unless I find specific sources stating otherwise. A total of 289 small employers have signed up for coverage through Covered California’s Small Business Health Options Program, better known as SHOP. These employers will provide coverage to a total of 2,155 employees. If you take a look at the Private QHP spreadsheet you'll see a new column: "Private SHOP Market". This is for enrollees in the ACA's Small Business Health Options Program, basically the small business (fewer than 50 employees) counterpart to the individual/family exchanges getting so much attention. This is one of those cases where percentages mask the real picture. 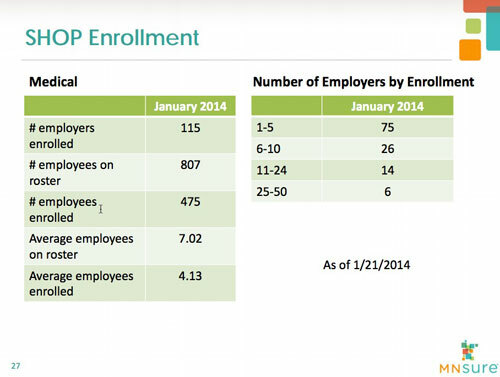 Yes, Hawaii has seen their Private QHP enrollments increase by an impressive 43% since December 28. However, they only had 2,192 people enrolled in the first place...the actual increase is only 934 people, to 3,126. Furthermore, those 934 have to be subtracted from the almost half-million "Not Broken Out By State" tally at the top of the spreadsheet, since they came in before 1/24/14. On the other hand, this also gives the first SHOP (Small Business Exchange) entry for Hawaii...another 307 people. As of Jan. 18 the Connector enrolled 3,126 people, though 13,000 applicants were deemed eligible for tax credits to reduce the cost of coverage. Of the 373 small-business groups that applied, only 75 employers were enrolled with 307 workers selecting plans. A very nice bump in Oregon's numbers today, especially given their ongoing technical issues. Private QHP enrollments are up from 23,800 as of Jan. 15 to 30,157 as of Jan. 24. However, since yesterday's HHS Dept. announcement of appx. 3 million total enrollments was "as of this week", this doesn't impact the overall total; it simply subtracts about 6,000 from the "Unspecified" number. Expect a lot of this over the next week or two until the enrollment updates "clear" the Week 16 point. OK, yesterday's update was apparently a bit premature; MD is actually up to over 25K, though they're still under 17% of the CBO projection figure. The Medicaid tally hasn't changed since last week. Through January 18, 25,177 Marylanders have chosen to enroll in private health plans through Maryland Health Connection. 93,514 Marylanders signed up through the Primary Adult Care (PAC) program were automatically enrolled in Medicaid coverage on January 1, 2014, and now have full Medicaid coverage. As of January 14, an additional 29,517 individuals were newly enrolled in Medicaid effective January 1. No details or full source as of yet, but this is obviously an important update. Will provide additional details/sourcing as available. Three million Americans have enrolled in #Obamacare private plans, @sebelius says in Jacksonville, FL. +800,000 so far in January. UPDATE: OK, now I have it directly from HHS Director Kathleen Sebelius' official Twitter feed. 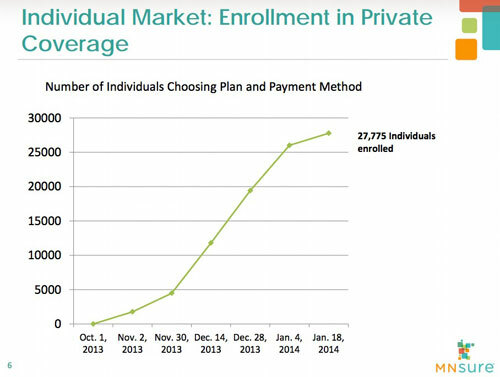 A key milestone: about 3 million Americans have now enrolled in a private Marketplace plan. RT to share the good news! Since the beginning of open enrollment, millions of Americans are gaining access to health coverage–many for the very first time—thanks to the Affordable Care Act. The most recent data indicates that approximately 3.0 million people have now enrolled in a private health insurance plan through the Federal and State-based Marketplaces since October 1. 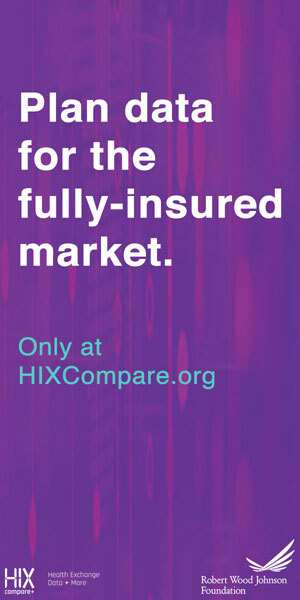 It's also important to note that the press release specifies that this only includes enrollments through the exchanges, and does not include people enrolling directly through the insurance companies themselves. This is a potentially huge number. More to come on this soon (I hope). Important detail on new numbers: Admin. official tells me they represent sign-ups through Jan 15, so not the whole ball game for this month. Looks like Maryland has bumped their private enrollments up by over 10% from 20,358 as of Jan. 11 to 22,500 within the past couple of days. Only 22,500 people have enrolled in private health plans through the Maryland exchange. That’s 15% of the state’s enrollment goal of 150,000 by March 31. The December report released Jan. 21 by Covered California shows that from Oct. 1-Dec. 31 the exchange received 1,107,229 electronic applications for health care coverage through both private plans and Medi-Cal. Multiplying that number by 1.8, "based on an average of 1.8 individuals per application," it was estimated that the number of applications represented 1,993,012 individuals. The 1.8 factor was not used for "completed applications." From Oct. 1-Dec. 31, there were 771,008 completed applications for health care coverage through Covered California (including Medi-Cal) for 1,456,909 individuals. If the 771,008 completed applications had been multiplied by 1.8, there would have been only 1,387,814 individuals. This indicates that individuals, not households, were counted in the completed applications. From Oct. 1-Dec. 31, there were 500,108 enrollments in a Covered California health plan (this did not include Medi-Cal). Of the 730,449 individuals who were "determined to be eligible for enrollment in Covered California", more than 2/3 enrolled. Clearly these were enrollments by individuals, not households. OK, in some ways this is gonna make my previous Medicaid analysis (which was confirmed by the CMS a few days later) seem like kid's play, but in other ways it'll actually be far easier to follow. Not only have I prepared multiple screen shots of the spreadsheet involved so you can see exactly what numbers changed and why, but there's far less guesswork on my part as to which cells to keep or eliminate. All of the relevant reports, along with the actual spreadsheet itself (with all 6 worksheets) are linked to at the end of this screed. You see, while my 6.3M figure from several days ago does match the 6.3M total that CMS announced yesterday, there are still some anomalies, because my 6.3M includes some additional data that's been released since the end of December, while their 6.3M includes the December "direct ernrollment" data for all 50 states that I didn't have access to. There are some additional factors to sort out, and I decided to start from scratch to figure out what they were. What I found surprised me. 9 The following states have included renewals in their application data: Nevada, New Mexico, Ohio, and Pennsylvania. These states have included renewals in their determination data: District of Columbia, Iowa, Maryland, Michigan, Missouri, Nevada, North Dakota, New Mexico, Pennsylvania, South Carolina, South Dakota, Texas, Utah, Virginia and Wyoming. Some of these renewals are conducted without the individual submitting a new application, using information already in the system that the individual is asked to verify. Well, now, this certainly answers a burning question, doesn't it? If those 14 states (+DC) do include Medicaid/CHIP renewals (aka redeterminations) in their data, then that means, by definition, that the other 36 states don't include renewals. ACA Signups, 1/21/14: Med/CHIP 6.32M. CNBC Just Now: Med/CHIP "more than 6.3M"
By the end of December, more than 6.3 million people were determined to be eligible for Medicaid or CHIP, the program covering children, through state-run agencies and state-based Obamacare exchanges, according to a Centers for Medicare & Medicaid Services report released Wednesday. That tally does not include the 750,000 or so people who were determined eligible in Medicaid through the federally-run Obamacare exchange HealthCare.gov. Adding the two enrollment numbers together equals more than 7 million Medicaid-eligible determinations. But some of the determinations made by HealthCare.gov may be duplicative of state-based decisions. As it happens, if you look at the Medicaid/CHIP spreadsheet, I deliberately left out about 620,000 Medicaid enrollees from the total because I suspected they would otherwise be double-counted. Read more about ACA Signups, 1/21/14: Med/CHIP 6.32M. CNBC Just Now: Med/CHIP "more than 6.3M"
Nevada keeps it simple & to the point (which makes sense, since they use their Twitter feed for enrollment updates); an 8% increase in private enrollments from Jan. 11 to Jan. 18, to 20,399 total. Update as of 1/18: 20,399 consumers confirm Qualified Health Plan selections on Nevada Health Link. 13,159 have paid. When I posted my big Medicaid/CHIP spreadsheet overhaul, I was understandably concerned that I missed something major--that there had to be some factor lost in the messy, semi-overlapping reports from HHS and CMS that would account for big swaths of the 1.7 million "extra" Medicaid enrollments that I've "found" (in reality, those 1.7 million have been gradually accruing ever since the beginning of October, I just wasn't able to pin them down into a tangible format on the spreadsheet & graph until now). As a case in point, after the overhaul, I have California sitting at 1.214 million new additions to Medicaid/CHIP programs. Today a friend provided a link to a story out of the Fresno Bee from 4 days ago, in which the Cailifornia Dept. of Health Care Services reveals that enrollments in Medi-Cal (CA's implementation of Medicaid) have gone up from 8 million people last year up to about 9.2 million as of now...a difference of about 1.2 million. I'm not saying that there aren't flaws in my methodology; no doubt there are, but this certainly helps set my mind more at ease.